The earliest and most complete categorization of the Taiwanese aborigines was proposed by Japanese scholars, Ino Kanori and Awano, during the period of Japanese rule (1895-1945). They divided aborigines into seven groups: the Atayal, Bunun, Tsou (or Sao), Paiwan, Tsalisien, Puyuma and Ami. Right after their research, Torii Ryuzo published a report in 1910 in French, categorizing aborigines into nine ethnic groups: Atayal, Bunnun, Niitaka, Sao, Tsalisien, Paiwan, Puyuma, Ami and Yami. The “Japanese expert of aborigines,” Ushinosuke Mori, simplified the category by combining the Paiwan, Tsalisien and Puyuma into one group, the “Paiwan” (which was later known as “the Paiwan group”), plus the Atayal, Bunun, Sao, Ami and Yami to make six ethnic groups. The “Barbarian Management Offices” under the Authority of the Police in the Taiwan Sotokufu (Governor-General of Taiwan) released “the Aboriginal Census” in which it added the Saishat to Ushinosuke Mori’s categories, making seven ethnic groups. Since then, this categorization was adopted as the official one during Japanese rule. Hwei-Lin Wei criticized that this category did not take group relations into consideration, even though it was based on field research; it was, therefore, merely an arbitrary listing. Utzukawa, Mabuchi Toichi and Miyamoto coauthored the book “The Formosan Native Tribes : a Genealogical and Classificatory Study” in 1935, in which they treated the Puyuma as an independent tribe called Panapanayan, changed the ethnic name of the Tsalisien into Rukai, and separated it from the Paiwan based on differences in their languages. They also suggested changing the name of the famous ethnic group in the eastern coastal plain, the Ami, into Pangtsah. Therefore, the Taiwanese aborigines were categorized into nine ethnic groups: the Atayal, Saisiat, Bunun, Tsou, Rukai, Paiwan, Panapanayan, Pangtsah and Yami. Many scholars have different opinions on the categorization, but now, the state and the general public accept the nine ethnic group categorization system (comprised of the Atayal, Saisiat, Bunun, Tsou, Rukai, Paiwan, Pyuyma, Amis, and Yami/Dao), and they also accept the Thao, Kavalan and Tarogo (Truku), which recently were officially recognized, for a total of twelve ethnic groups. According to “The Aboriginal Demographic Statistics of the Taiwan and Minnan area in the ROC” conducted by the Council of Indigenous Peoples under the Executive Yuan in 2003, the population of the Paiwan is 69,625, making it the third largest ethnic group behind the Amis (147,895) and the Atayal (89,693). The Paiwan mainly live in the southern chain of the Central Range, from Damumu Mountain and the upper Wuluo River in the north to the Hengchun Peninsula in the south, and also in the hills and coastal plains in southeastern Taiwan. 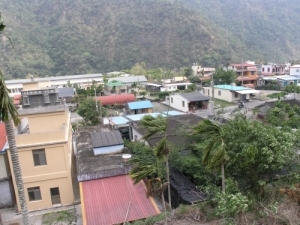 Administrative districts where they live include Sandi, Majia, Taiwu, Laiyi, Chunrih, Mudan, Shihzih and Manjhou Townships in Pingtung County, Beinan, Jinfong, Taimali, Daren, and Dawu Townships in Taitung County, and a few in Jhuosi Township in Hualien County and Sanmin and Taoyuan Townships in Kaohsiung County. The Paiwan are divided into the Raval and the Butsul subgroups. The Raval subgroup lives at the upper stream of the Buwuluo River, which is about eight hundred meters in elevation, at the confluence of the Koushe River and the western hill of Nanda Mountain, in Saijiia, Koushe, Anpo, Shashi, Dalai, Dewun, Dashe, Sandi and Maer Villages in Pingtung County. The Butsul subgroup is composed of the Paumaumaq (or Northern Paiwan), Chaboobol, Parilario (or Southern Paiwan), and Paqaroqaro (or Eastern Paiwan) branches. 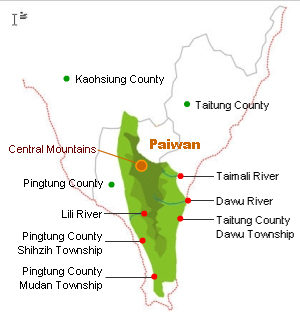 The Paumaumaq branch is settled in the region from the Koushe River in the north to the Linbian River in the south, mainly in Fawan, Majia, Beiye, Liangshen and Jiiayi Villages in Majia Township of Pintung County, Taiwu, Jiiaping, Pinghe, Wutan and Jiiasing Villages in Taiwu Township, Yilin, Gulou, Nanhe, Wangjiia, Wunle and Danlin Villages in Laiyi Township, and Cijiia and Lilee Villages in Chunrih Township. The Chaboobol branch resides from the Shuaimang River in the north to the Linbian River in the south, mainly in Chunrih, Shihwun, Gueichong and Guhua Villages in Chunrih Township in Pintung County, and in Jhukeng, Fonglin, Danlu, Caopu, Shihzih, Heping, Nanshih, Neiwun and Neishih Villages in Shihzih Township. 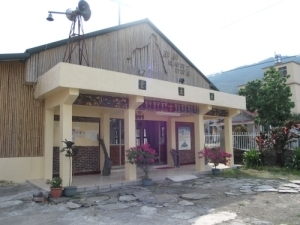 The Parilario branch is scattered along the Hengchun area in southern Taiwan, mainly in the Nyureng tribe of Mudan Village in Mudan Township, as well as Mudan, Dongyuan, Sihlin, Gaoshih, Shihmen Villages in Mudan Township and Manjhou and Lide Villages in Manjhou Township of Pintung County. The Paqaroqaro branch is found in Taimali, Daren and Dawu Townships in Taitung County, at the eastern slope of the Central Range, at the site of the drainage area of the Dawu, Dajhugao, Ganzihlun and Taimali Rivers, including Tuban, Taiban, Sinhua, Anshuo, Nantian and Senyong Villages in Daren Township, Binmao, Sinsing, Jiieda, Bilu, Liciiou and Jiialan Villages in Jinfong Township, Dawang, Jinlun and Duoliang Villages in Taimali Township, Dajhu, Daniao, Dawu and Shangwu Villages in Dawu Township, and Danan Village in Beinan Township. Paiwan tribal living areas are situated below 1,500 meters in elevation, with a majority of tribes building on hills between 100 and 1,000 meters. The Japanese government implemented a migration plan to move tribes in deep mountain areas outward to the hills after the Wushe incident in 1930, and this had a significant impact on the Bunun, the Atayal and the Paiwan. The local government under KMT rule launched another large-scale migration plan targeting the Paiwan tribes in Pintung and Taitung Counties; the plan called for building new communities and provided assistance with transport to relocate deep mountain tribes. Paiwan social structure is hierarchical, based on land ownership and primogeniture. Land ownership is passed along to the first born children; thus, primogeniture forms the basis of the hierarchical social system. The hereditary class system consists of three social tiers: the noble class, the distinguished class and the commoner class. Tribal members inherit their social status at birth. 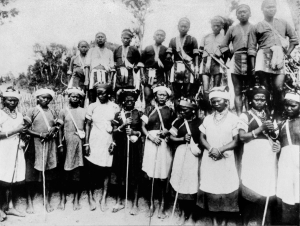 In the Fawan tribe, for example, there are three social tiers: the noble class (mamatsangilan) are landlords' close relatives who are divided into landlords, core nobles, secondary nobles and marginal nobles through kinship ties with the landlords; the distinguished class (pualu) are inferior to the nobles but superior to the commoners, whose first born will inherit the status of pualu, while their other children will become commoners; the commoners (kaktitan) are landlords’ relatives who do not share at least one great-grandparent with a landlord. The membership of this class is more diverse; while some members are distant relatives of landlords, others are not landlords’ relatives at all. privileges along class lines. To be a landlord, one must own farms and houses. He can collect taxes, such as land tax, hunting tax, mountain tax, water tax and so on; he is granted the privilege of getting a full human shape tattoo, a special family name, a special personal name, a larger house with a snake, deer, or human head carving on the lintel, a human sculpture in the front living room, a platform in front of the house, the right to cohabit with single women before marriage, the right to wear leopard leather, and exemption from military duty, which is inherited by all of the landlords’ children. The distinguished class has similar social status to the marginal nobles but differs only by tattoos and personal names. The commoners must earn their living and decorations by labor, and enhance their social status through personal performance in warfare or hunting games or through carving skills; otherwise, marriage can be another route to a higher class for their next generation. The Paiwan apply three marriage rules to upgrading or downgrading in class, which are also known as the “three hierarchical marriage forms”: marriage with the same class (mitservong), marriage with the upper class (slungua), and marriage with the lower class (slungoja). Marriage with the upper or lower class takes both status and wealth into consideration, and can occur both among different classes and also between different levels of the nobility. The Paiwan do not have strict marriage rules that apply to members in the same class. The status of individuals and their descendants can be modified through marriage among different classes. The Paiwan nobles were holy and sacrosanct and also had special personal and family names as well as household emblems shown on carved stone pillars, crossbeams, and lintels; they also had the right to wear special decorations such as leopard leather, lazurite beads, and tattoos. 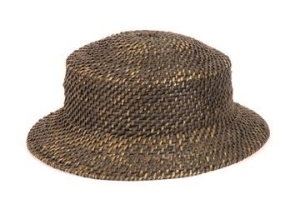 The items they use were decorated with distinct patterns, such as human heads and hundred-pace snakes. There is still some awareness of hierarchy in modern Paiwan society. The Paiwan people know the relations between one another’s class; even though the chief no longer has the right to collect taxes, they still respect the landlords and the nobles. For example, the most honorable seat at a banquet is reserved for the chief, who will receive the first toast, too. Young people still follow this custom today. The Paiwan people's living style is settlement in one place with a certain number of group members. The main concern when choosing a settlement site is the availability of water resources, so most tribes are built on two river banks. The tribe can be a single village or composed of several villages. In most cases, a bigger and more centralized tribe makes up the core, and some neighboring affiliated villages join to form a tribal union. As long as the house is built on land owned by the landlord, members who live in the house are under the landlord’s command, and all the members governed by the same landlord form a social group based on geographical relations. By tradition, tribe is the basic political unit for defense and revenge. Every political matter is decided by tribal officials elected by the tribal council. The tribal council is the policy making agency composed of elders elected by each residential district, and its positions are held by tribal officials. Tribal officials and elders in the council have a permanent place. Political decisions are put into effect by tribal officials. Rituals closely related to the fortune of the entire tribe are conducted by tribal priests. Sorcerers select tribal priests by divination. Tribal priests are also selected for life. 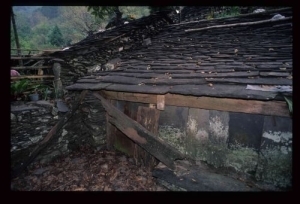 Traditionally, the northern Paiwan house is asymmetrical, built from slate, shale and wood with the back wall situated against a foothill. Social hierarchy is reflected in various features of the house, such as the arrangement of the space, the size of the building, the scarcity of the materials and the use of special symbols. Those in the upper class have more living space than the commoners. They also use larger stone or wood. The large space and its arrangement serve two social functions; first, the large space and house show the power and status of the owner, and second, a spacious front yard is the villagers’ gathering place, indicating its significance as a social and ritual center. The traditional production method of the Paiwan is the same as other Taiwanese aborigines. They also practice slash and burn agriculture together with hunting, fishing in the mountainous creeks, and animal husbandry. Food production is partially consumed by the producers, and partially submitted to the nobles as tax. 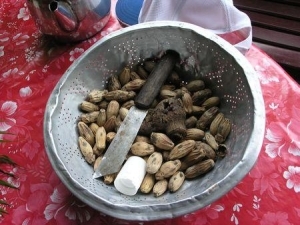 Even though the use of shell and iron tools as currency has been recorded, and millet, meat, betel nuts, and taro have also been used in trade; broadly speaking, the Paiwan do not have a subsistent economy nor any type of market system. However, the food redistribution system resulting from the social hierarchy has become one of the distinct features of the Paiwan culture. Millet and taro are their major foods, but peanuts, pigeon peas and sweet potatoes are also part of their diet. 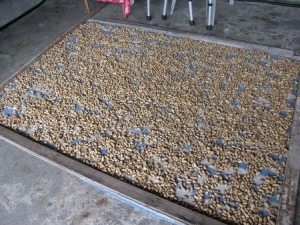 Roasted taro can be preserved for a year in storage. Agricultural labor is mainly done by the household, which is also the basic production unit. Labor exchange is not limited to specific members or groups, so if more hands are needed to clear the fields, prepare the soil or bring in the harvest, the Paiwan can take turns working in one another’s fields or hire workers in exchange for food. The workers can be non-relatives. Hunting is the men’s job. Both hunting and animal husbandry provide the main meat resources. Hunting is done in groups or alone, but since the hunting fields customarily belong to the nobles, hunting tax must be paid to the field owner. The Paiwan raise pigs, dogs and cows. Dogs assist with hunting, cows carry goods, and only pigs are used as a food resource. Pigs are usually slaughtered for special rituals, weddings, or house warming parties. The Paiwan also need to pay taxes to the nobles on these occasions. Fishing is the men’s secondary task. They use sharpened tools to catch fish, or they use the fishing weir method in creeks. Submitting a certain amount of fish to the noble who owns the creeks is another type of hunting tax. Hunting and fishing are still the Paiwan people's favorite activities, but their economic importance is not as significant as before. Now they merely serve as entertainment or group activities. Domestic animals are mainly consumed on special occasions or as ritual gifts for family and friends, but in some regions where transportation is more accessible, pigs are sold for additional income. There are two features of the Paiwan supernatural system: first, ghosts and gods are in the same category, tsmas, but some are good and some are evil; second, the supernatural world is another world parallel to the human world and both worlds exist in the same space and time. Gods protect people if they follow the rules recognized by society. The rules are applied to everyone without exception, so they are also called taboo. Violating taboo is punished by disease or injury, because the gods’ instructions have been spurned. If supernatural spirits persecute people without any reason, then these spirits are devils or evil gods. People are punished if they violate the gods' rules, but people also suffer from the attacks of evil gods or devils, even when they have done nothing wrong. Therefore, the Paiwan ascribe all physical or spiritual misfortune to supernatural forces. Not only do they enthusiastically perform rituals for ghosts and gods, but they also strictly and actively obey the taboos set by supernatural powers. 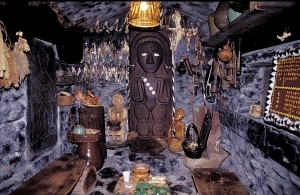 Only sorcerers can perform rituals properly, so when the Paiwan obey the rule of supernatural powers through their action or inaction, they are under a type of social control. 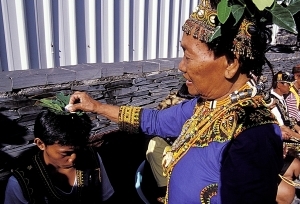 From this perspective, sorcerers and witchcraft improve social control in Paiwan society. he major practitioners of the Paiwan religion are priests, who perform rituals, and sorcerers, who perform healing treatments and divination. Priests include family priests and tribal priests, depending on the size of the unit involved in the ritual with which they are charged. Family priests hold rituals for households and families, while tribal priests perform rituals for the entire tribe. Depending on the nature of rituals, some are performed by male priests and some by female ones. Sorcerers hold a divination ceremony in order to select tribal priests. 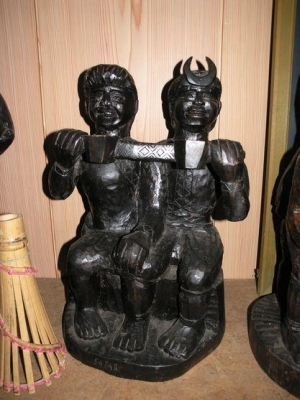 There are two tribal priests per tribe, and the priests can be either male or female, but for practical purposes, having one male and one female priest is the better arrangement. Tribal priests are selected by the gods but they can take the role of family priest at the same time. They can perform rituals in their own household, and be hired by other households, too. The power of witches stems from gods, with whom they communicate through spells, similar to those of shamans in primitive tribes. The skill of witchcraft, including all spells, instruments and ritual procedures, is passed along from masters to disciples. Religious activities concentrate on all sorts of rituals. Among the Paiwan rituals, the five year festival (maleveqe) is the most famous all-purpose ritual; weather related rituals include rain praying, sun praying, wind stopping and thunder stopping; land and tribe related rituals include praying for land, the community and for a source of water; agricultural rituals include a number of harvest festivals, such as millet seeding, millet storing and millet harvesting; in addition to the above rituals, there are rituals for head hunting, hunting, tattooing, contagious diseases, domestic animals, household, wealth, tools, fishing, etc. The five-year festival is not held in every tribe. Its meaning differs slightly among different tribes. In Laiyi and Majia Townships, the purpose of this festival is to worship and thank ancestors and gods by sacrificing a portion of meat and plant from the last five years, no matter whether the sacrifice is game, (such as wild boar or leopard), trophies or crops. The five-year festival is the largest and most symbolically rich Paiwan ritual. The reason why it is called the “five-year festival” is that it is an all-purpose ancestor worship ritual held once every five years. This ritual has been conducted even earlier than the Dutch rule era (1624-1662). There is an activity known as “spearing the bliss balls” in the festival, which symbolizes an appeal to the gods for their benevolence, and for good luck, prosperity and fortune. Spearing the bliss balls is a way to pray for a good harvest, a fruitful hunt, good health, prosperity, successful defense or conquest. It has been called a festival since the end of World War II, but its real meaning is “ancestor worship." All of the eight townships in Pintung County conducted solemn ancestor worship during Japanese rule (1895-1945), until the influence of western religion prevailed in the post-war era. The main goal of ancestor worship is honoring ancestors, not merely singing and dancing. The festivals are now conducted by the town government, not the chief. Tribes have different ways to celebrate the annual festivals in August; for example, people who are not Catholic or Protestant wear traditional dress according to the tribe’s custom, but Christians take flowers and fruits to worship at the tombs in lieu of traditional sacrifices, and they also hold various cultural or recreational activities, depending on their denomination, to replace the traditional worship of gods and ancestors. Due to the transformation of social life, even though priests and sorcerers still retain their high social status to some extent, they have lost their traditional role in society. The five-year festival is a cultural and historical mechanism for the Paiwan to distinguish themselves from others, to reconstruct their self-image, and to unite the entire ethnic group in the face of conflict and throughout their history of struggle to survive among other tribes or ethnic groups. Through the activities in the five-year festival, the Paiwan people have embodied the spirit of cooperation ever since the foundation of the tribe, and they have continually demonstrated their traditions and customs from their long history. This festival is also an occasion for reconciliation among group members, in order to rebuild and reunite the entire community. Tribal life contains symbols and cultural settings of historical, spatial and social representations, such as myths, legends, place names and the five-year festival. These symbols and representations demonstrate the historical awareness of viewing the tribe, the chief, the clan leader and even the original family as the center of the society in the pursuit of a stable future and self-achievement. A more detailed ethnography is necessary to obtain a better foundation for the categorization of Taiwanese aborigines. Even though scholars have made the Paiwan, the Rukai and the Puyuma into three independent ethnic groups, it is undeniable that the Paiwan and the Rukai share some common features of social organization and material cultures. I presume that geographical proximity and other social factors such as intermarriage among nobles cause more frequent contact in some regions, which leads to enculturation of these two ethnic groups. However, they still retain some distinct features in their traditional rituals and clothes. The Paiwan have a unique style to their tribal art crafts. The art form of delicate embroidery is essentially the product of the social hierarchical system. Aboriginal art is full of creativity and life; wood, stone, bamboo and bone carving, clothes, lazurite beads, tattoos and weaving are all practical and artistic. 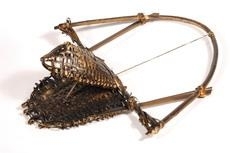 All Paiwan art crafts are presented in recognition of the nobles. They use artistic decoration to solidify their social status and honor their class. Only the nobles have the privilege of installing wood and stone carvings in their houses, of having tattoos or body ornaments, of wearing luxury clothes and special headwear, and of owning ancient pottery kettles and lazurite beads. Hence the meaning of tattoos transcends the visual and aesthetic. For example, the hundred-pace snake and human images are two holy patterns. But all in all, the Paiwan art lacks motifs from daily life. The hierarchical system has brought the nobles many political and econonomic privileges, so when they endeavor to consolidate their power and renown, their art reaches a correspondingly exalted level. It can be said that hierarchy and art complement each other in Paiwan society. The nobles enhance their social status, increase their holiness and mystique by means of magnificent, memorable, splendid and provocative emblems and decorations. In times of social transformations, the free-market economy has ruined the hierarchical system, and the nobles no longer have leisure time to devote to artistic decoration; in the meantime, the commoners are no longer deprived of the right to decorate. The root of the difficulties that Taiwanese aboriginal groups faced in adapting to outside cultures is that their society was based partially on agricultural and partially on hunting, so they had been self sufficient for the previous few hundred years. Moreover, their society is based on kinship ties combined with strictly personal and private education. According to Professor Shih-chung Hsieh, the aboriginal intellectuals initiated the aboriginal social movement to strive for respect and rights from the Han Chinese. According to the movement leaders’ interpretation, the Han Chinese are responsible for most of the negative situations that have confronted the aborigines and their culture in modern society. In addition to social movements, the aborigines launched what is known as “the second wave of the cultural movement for all aboriginal people” in the mid 1990s. Taiwanese people have embraced tourism as part of their daily life in recent years because of governmental promotion and social forces. Aboriginal outer culture is the most obvious category to draw upon when promoting tourism. New aboriginal values in modern society involve intermingling among groups, so cultures of different ethnic groups can be diverse while still maintaining a single aboriginal personality and a single aboriginal art mentality. This tolerant mentality helps outer cultural categories to move fluidly between tribes, to build a broad Forth World, to harmonize tourism, tradition and creation, as well as to achieve the “unity” of all Taiwanese aborigines. From their art work, we witness the formation of “the united aborigine” in modern Taiwan cultural history. 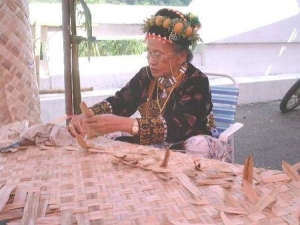 The Paiwan have a solid art tradition and techniques. 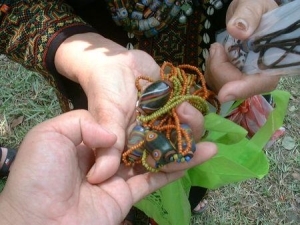 The development of their handicrafts such as weaving, wood carving, embroidery and bead sewing has reached a high level, so it is worth encouraging and promoting their art work in order to improve the entire Taiwanese aboriginal culture industry.